Apple has dropped Boot Camp support for installations of Windows 7 on the recently refreshed 13-inch MacBook Pro and MacBook Air lineup, meaning users will have to switch to third-party virtualization software, upgrade to Windows 8 or wait for Microsoft to release Windows 10. According to a Support Pages document posted on Apple's website, Boot Camp running on early-2015 13-inch MacBook Pro with Retina display and 11- and 13-inch MacBook Air —all of which went on sale earlier this month —is only compatible with Windows 8 and above. It appears that Apple is moving away from Windows 7 as new Mac hardware is released, a trend started with last year's Mac Pro. The company did much the same when it ended Boot Camp support for Windows XP and Vista when the second-generation MacBook Air debuted in 2010. For users invested in Windows 7, third-party virtualization software like Parallels Desktop 10 and VMWare Fusion 7 offers support for legacy Windows releases on Apple's latest OS X 10.10 Yosemite operating system. Unlike Apple's dual-boot solution, virtualization software is much more flexible and can weave together features from both installed operating systems to crete a seamless, integrated user experience. 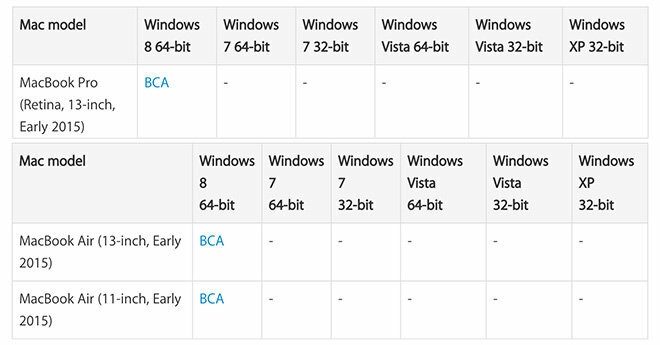 Alternatively, Microsoft in January announced it would offer a free upgrade path to Windows 10 for Windows 7, Windows 8.1, and Windows Phone 8.1 users, a move echoing Apple's decision to make OS X upgrades free. Microsoft's next-generation operating system is slated to come out later this year.